For the past 75 years The Rotary Club of Gravenhurst has initiated and donated to some wonderful causes. In our first year, 1937, during the depression, we distributed milk to every public school child in town. Then in the 40s we started the swim programme at Gull Lake Rotary Park and running it until the town created their own Recreation Department. In the 50s the beautiful grand piano in the Opera House along with its upkeep was a donation from the club. When the piano needed refinishing the club raised $5,000 to cover the cost. The elevators at the Opera House and the Seniors Centre were also two of our projects, along with the library, the Scout Hall and a major sponsorship of The Seniors Centre. A flagpole at the old Centennial Centre was our 50th Anniversary project. For our 60th we constructed the picnic shelters at Kinsmen Park, and assisted in the construction of the playground. 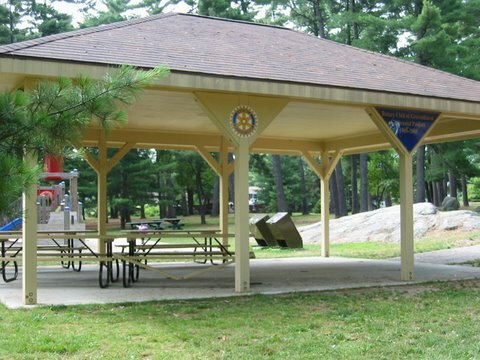 We enjoyed building the picnic shelter and the playground at Gull Lake Rotary Park plus working with the Lions Club and others in town to construct the Lions Pavilion. Besides building and tangible projects Rotary has offered many of our school age sons and daughters Student Exchange programmes to foreign countries, Adventure programmes in High Tech, Tourism, Citizenship – Economics of Staying in School (ESIS) and Rotary Youth Leadership (RYLA). Two electronic bulletin boards were donated to our high school. 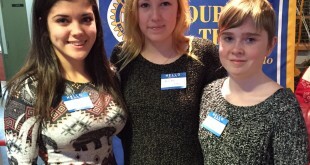 The Rotary Bursary Endowment Fund has been established to assist students to continue on to higher education. Chess in Schools, Literacy assistance, Reaffirmation of Citizenship , team uniforms are all part of our commitment to our students along with contributions to the Rotary Youth Talent Show, Girl Guides, Scouts, Minor Hockey, Minor Soccer , and others. Many individuals in need have requested and received financial assistance from Rotary. 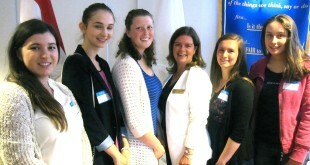 Muskoka Easter Seals Snowarama was a huge success for many years spearheaded by our Rotary Club. We sponsored the Rotary Town Hall Series for years until it became the Muskoka Concert Association. It is an honour for us to recognize an OPP Officer of the Month; with many of the officers receiving multiple awards. We are proud of our commitment to our town (as well as many of our worldwide projects)…We are proud to have been part of this town for over 75 years as a club and look forward eagerly to more exciting projects to come.